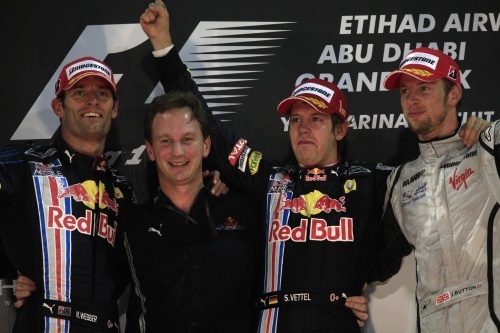 Milton Keynes based Red Bull Racing finished the season on a roll with their drivers Sebastian Vettel and Mark Webber finishing 1st and 2nd at the inaugural Abu Dhabi Grand Prix. Christian Horner and Adrian Newey will no doubt be on a high following the dominate end to the 2009 season and an extremely strong second place in the Formula 1 Constructors Championship. The first Grand Prix to be held in Abu Dhabi has been hailed a significant success with the all-new Yas Marina circuit looking stunning against the back drop of the setting Arabian sun. Lewis Hamilton had been favourite to win the race following a dominate qualifying session on Saturday during which he clinched a spectacular pole position. However, an unusual reliability issue with his McLaren MP4-24 caused safety concerns and resulted with him retiring from the race shortly before half distance. World Champion, Jenson Button, enjoyed another strong performance in the Brawn GP car and secured the 3rd place on the podium to complete a memorable season for him. The GP2 Asia series 2009 also commenced in Abu Dhabi and will see three BRDC Members taking part: James Jakes, Sam Bird and Oliver Turvey. All had a promising start to their respective campaigns with James taking third place in race one and Oliver fourth in the second. Sam was forced to retire from a strong fourth position on the penultimate lap of the first race, but set the fastest lap of the race in the second. Also taking place this weekend was the FIA World Touring Car Championship penultimate round at Okayama, Japan. Andy Priaulx, who had only missed out on pole by 0.0.050 of a second in qualifying, drove an incredibly impressive race in the most challenging of conditions. The torrential rain that is so well known in that part of the world hit the circuit 30 minutes before the start of race one. The conditions for all competing were challenging to say the least and despite failing brakes towards the end, and a strong challenge from his fellow BMW driver Jorg Muller, Andy maintained the lead to secure a second victory of the season. Fellow Member Rob Huff came a commendable 3rd for Chevrolet. In the second race of the World Touring Car Championship weekend, Andy secured 2nd place in yet another very wet race, with Rob 6th. BRDC Rising Star Robert Wickens secured 2nd place in the 2009 FIA Formula 2 Championship when he took 3rd place during the second race of the weekend in Barcelona. In the first round of the Asian Le Mans series which is also held at Okayama, in Japan, Paul Drayson and Jonny Cocker secured 6th place in their LMP1 Judd powered Lola coupe. Whilst this, on paper, appears a reasonable result for the first competitive outing in this new car for the pairing, they will be disappointed following Jonny’s pole position and early lead in the race. Were it not for the requirement for the new nose due to failed lights, they may well have gone on to win their first outing. The second race of the weekend saw them improve to 4th position and the combination certainly looks a potent one ahead of the full blown Le Mans Series which Drayson Racing intend to compete in next year. Closer to home at a rain soaked Silverstone, the Walter Hayes Trophy was won by young American Connor De Phillippi, on his first visit to the circuit. At 16 years and 10 months he becomes the youngest winner of the Walter Hayes Trophy and the second member of the Team USA scholarship programme in succession to do so, following Conor Daly’s victory last year. Having led the final soon after the start, Connor dropped back to fourth place before working his way back to the front to win by a second from Robert Barrable.